RENUA’S REACTION TO the party’s disastrous electoral performance will see it change its name to a variant of Renua – The Liberal Democratic Party. Although the name change is not official yet, the rebranding was decided at a meeting of party members a fortnight ago that also saw leader Lucinda Creighton stepping down as leader. Renua lost three sitting TDs in the February election with many members expressing the view that the party was inaccurately perceived as a right-leaning conservative party. The name change is part of an effort to reposition the party after the departure of Creighton, who founded the party less than two years ago. Party councillor Pat McKee says that while the party is a broad church with members of different political persuasions, many within its ranks would consider the term ‘liberal democrat’ to be an accurate description of their beliefs. “I think it’s representative of a significant portion of members,” he says, adding that some right-wing policies in the party’s manifesto were not. There’s no doubt there was a veer to the right in terms of policy. The party has four elected councillors and current party rules state that the party’s leader must be an elected representative. McKee says there has been suggestions that this rule could be altered, something he personally would be open to. He added that he intends to continue to be active in the party for the moment but that he “wouldn’t be as optimistic as others” about its future. As well as losing its party leader, Renua’s communications officer John Drennan also left the party in the wake of the election result. Email “Renua Ireland is going to change its name”. 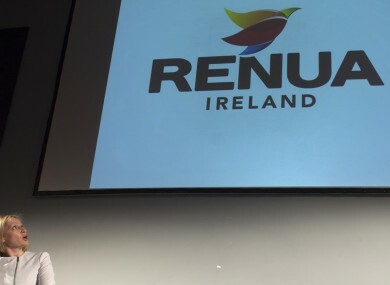 Feedback on “Renua Ireland is going to change its name”.